Stopover or business trip? The Mercure Paris Le Bourget hotel offers you 4-star well-being 5 miles (8 km) from Paris and close to the Roissy CDG and Le Bourget Airports. We can also assist you with your seminars for up to 250 people. 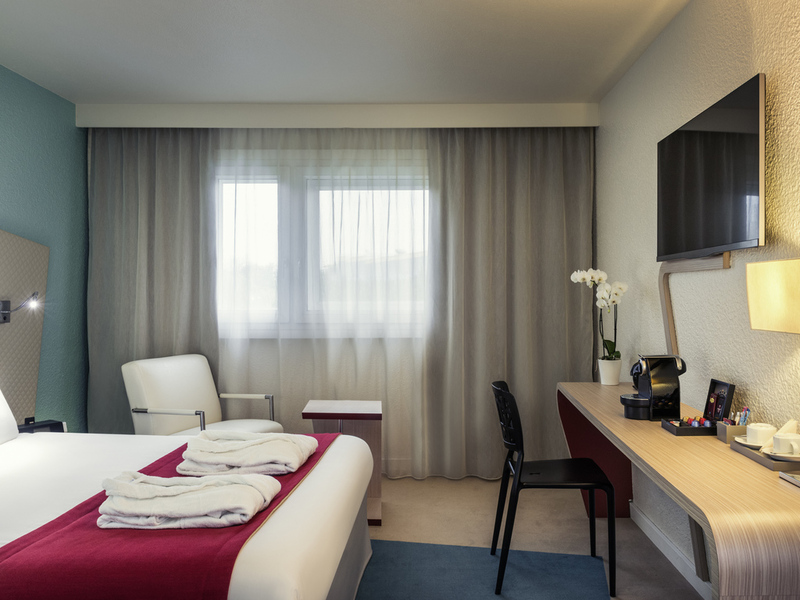 Located close to the Bourget and Villepeinte Parcs des Expositions, the Musée de l'air et de l'espace, Parc Astérix and the Stade de France, the Mercure Paris Le Bourget hotel has stylish rooms. Easy to access from the highway networks (A1, A3 and A104) a nd 15 min from the Roissy Charles de Gaulle Airport. After a day of work in one of our meeting rooms, relax in the restaurant, on the pool-side terrace or by savoring a glass of wine at the hotel bar. Located between Paris and Roissy Charles de Gaulle airport, visit the Le Bourget Museum of Air and Space, located only 5 minutes from the hotel, with the Stade de France nearby. Get to the Villepinte and Le Bourget exhibition centers within no time. Our proximity to the A1, A3 and A104 highways allows easy access to Disneyland Paris and Parc Astérix. Got a meeting or seminar to organize? Contact us! During a corporate seminar or a stop on the way to you family holiday, visit the famous Basilica of Saint-Denis, the Air and Space Museum or the botanical gardens in Courneuve Park. Our range of fully air-conditioned rooms with free WIFI will ensure that you have a relaxing stay that meets all your expectations. Choose a Standard, Superior or Privilege Room. All Privilege Rooms have a view of the pool and are equipped with an iPhone/iPod docking station, Nespresso machine as well as upscale bedding and other details to create an unforgettable stay. Our terrace was given a whole new look for 2016: make the most of it in warm weather. Enjoy delicious seasonal dishes prepared by our new chef. New spring menu as of April 20, 2016. No surprises, room clean, staff welcoming and attentive. A typical hotel for the Mercure network, quite a satisfactory level for a one-night stop near the Paris-De Gaulle airport. Pleased with a spacious free parking, clean rooms with excellent air-conditioning, kind service. The location makes this hotel suitable for only those traveling by car and needing an overnight stay close to the airport on the arrival or departure night. Extremely disappointed breakfast &quot;Take away&quot;, which had to take instead of a normal breakfast because of the changed time of departure of the aircraft, and which included a bottle of water, a croissant, an apple and a 200-gram box of orange juice. Bedroom was ok but carpet was full of stains. Room cleaned and beds made daily which was nice. Reception staff were very friendly. Restaurant /bar staff were friendly but service was very slow. We ate in the restaurant on 2 occasions and on both we had to ask for menus and then find staff to place our order. Our dirty plates weren’t cleared either. Also, other non-English guests were given bar snacks with their drinks something we were never offered. The staff was extremely helpful, Mary helped us find a parking garage downtown a printed Eiffel Tower tickets for us. Location problematic. I was not informed on the shuttle schedual to eurosatury and therefore had to take a taxi. one vehicle was moved to crash into another. My car was undamaged -this time. But I won't be staying again. Also, I selected 'Restaurant' but this was closed on the Saturday I visited. No point in saying that you have a facility if it's closed on the day the customer visits! restaurant only available to airline staff?! So after a long travel we finally arrived at the Mercure hotel in Paris nord. We, family of 4, 2 children aged 4 and 6, were tired and hungry and looking forward to a dinner in the hotel, then early to bed. Well, things turned out a bit different. When checking in at the reception we were informed that the restaurant was closed to non-airline staff. Did we wish to have a dinner? Then please find one outside the hotel. So off we went in search for a restaurant. Since the hotel is in the middle of an industrial area restaurants are not within walking distance. So back again into the car. After 10 minutes we found a shopping mall. And after another 10 minutes we managed to find a parking spot. Two and a half hours after check-in we finally returned in the hotel. In short: the Mercure hotel advertises on the website that it has a restaurant. It is only not available to customers like you and me. Shame on you.... Will not return to a Mercure hotel. The staff is helpful, but the hotel isn't great. There are a number of things I did not like at all: - The area in which the Mercure is located isn't exactly welcoming; it is said to be one of those with the highest rates of criminality in the whole of France. Could hardly be worse... - The beds are not great, but OK. The pillows, however, are terrible! - The restaurant refuses to serve the food on the menu; it only gets served to the rooms, even though they have the menu hanging out at the entrance to the restaurant. At the restaurant itself, they only offer a mediocre and massively overpriced buffet. The area isn't the hotel's fault. Yet, if they'd get new, more comfortable pillows, and get their restaurant to offer a choice by letting the guests choose their food off the menu, instead of forcing them to eat from an overpriced buffet, I'd consider choosing the hotel again. However, I don't see them changing their policy, so I am not very likely to visit the Mercure again. I will forward my opinion both to my company and to FlightSafety, whom my colleagues and I were attending a training course with, and ask them to take the Mercure off their list. Nice and big room with space where I could work, great breakfast. The staff was courteous,professional,very helpful. It was good The attention of reception it was really nice Just the restaurant it was a little bit not good because one day the told me that o need to eat in another part my breakfast and I said them that all the days that I kid I was eat at the restaurant just this day I went to eat at other room and that food it was terrible and so cold. The next day I went to speak at the reception and the guy just didn’t know that my breakfast was at the restaurant so just I think that they need a list for know who is going to eat at the restaurant and who it not .